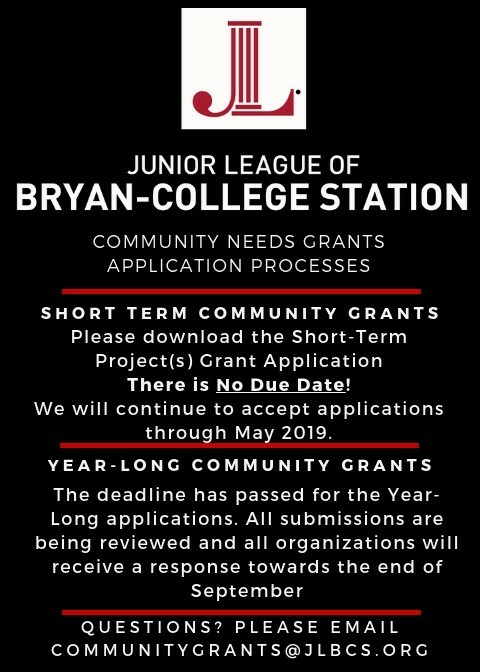 In addition to our service hours, JLBCS also offers grants to local nonprofit organizations that reflect our mission and values, and provides scholarships to incoming female freshman who demonstrate academic excellence and a passion for community service. We are currently accepting applications for 2018-2019 Short-Term Grants! For questions or to get more information, please contact our Community Grants Chair. In celebration of our 35th year of service, we had the amazing opportunity to award two Future Impact Gift (FIG) grants in the amount of $35,000 each. This is only the second time in our organization’s history where we have been able to award monetary gift(s) in such a manner: the first and previous time being in celebration of our 25th year of service, awarded to the Brazos Valley Food Bank. After months of research and deliberation, our membership determined the recipients of our two FIG grants, Family Promise Bryan-College Station and Scotty’s House Brazos Valley Child Advocacy Center. Family Promise BCS: Family Promise Bryan- College Station, Inc. provides safe environments where children remain with parents during a time of homelessness. With funds from the Future Impact Gift (FIG) grants, Family Promise will be entering Phase One to remodeling their facility, Hope Crossing, with new plumbing including sinks, showers, toilets, laundry units, etc. Scotty’s House: Scotty’s House Brazos Valley Child Advocacy Center, Inc. provides safety, healing, and justice for children victimized by abuse through professional assessment, counseling, and education in a compassionate and collaborativeapproach. Scotty’s House will be remolding their forensic wing with FIG funds from JLBCS in order to accommodate new staff members with the increasing number of victims requiring their services. Learn more about scholarship opportunities for graduating female high school seniors.